Welcome to Prepaid Phone News' regular Sunday Prepaid Phones on Sale this Week listing of all current US prepaid phone deals in one place. 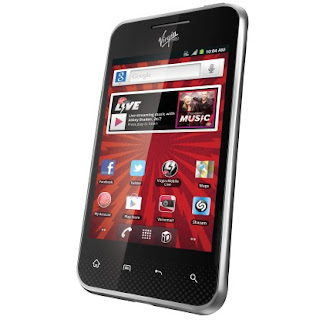 The deal of the week is the Virgin Mobile LG Optimus Elite Android phone on sale for $49.99 at both RadioShack and BestBuy . The regular price is $129.99. The Elite is a great phone for the money, the screen and camera are both considerably better than on other entry level Android phones. It's an especially good choice if you are on Virgin's grandfathered $25/month plan as it's the best phone available that won't bump your plan price up to $35/month. If you can find the Elite in a RadioShack store you can use this $10 off coupon from the Shack's Facebook page to cut the price of the phone to just $39.99. AT&T (online only) The AT&T Website offers free shipping on all phones and $5-$30 online-only discounts on most phones. There are some especially good good deals on refurbished phones which are listed below. CowBoom (part of BestBuy) used phones with warranty - free shipping. Cricket free shipping and free activation on all phones. Prices and availability are for Cricket native coverage areas. Prices are different and not all phones available in Cricket MVNO areas. MetroPCS 2 day priority shipping is free on all phones. NET10 (online only) Free shipping on all orders $19.99 and above. Not all phones are available in all areas. Free reconditioned LG 300G bar or Samsung T201G flip phone with purchase of a $25 refill card. $30 off the price of any Android phone plus a free SIM with the purchase of a $40 or $50 Unlimited Plan PIN with code PTELANDSLICK. RadioShack Shipping $6.99 unless otherwise indicated. Free ground shipping on orders over $50. Free Ship to Store. Straight Talk (online only) Free shipping on orders of $29.99 or more. Not all phones available in all markets. Free LG 220C or Motorola W418G flip phone with purchase of a $30 All You Need refill. Free LG 620G slider or LG 220C or Motorola W418G flip phone or Samsung T528G touchscreen with purchase of $60 International Unlimited refill. TracFone (online only) free shipping on all purchases $19.99 and over. Not all phones available in all markets. T-Mobile (online only) Shipping is free on all phones. Virtually every Tmobile phone is repriced upward as part of its total company revamp today. Not true. Grandfathered $25 plan users can switch to the Elite and keep their grandfathered rate. no they won't be grandfathered in that was only for a limited time. There are many, many reports on Howard Forums and other sites by grandfathered users saying that they were able to switch to the Elite without losing their grandfathered rate. Here's one from January and another from December. You can find dozens more if you search. I've haven't seen anyone who actually tried say it didn't work. No, I have no connection with ShopCellDeals. Can we use Virgin Mobile LG Optimus Elite on pageplus ? Only if you can figure out how to flash it or pay someone to. Tmobile is discounting all prepaid smartphones $50 by including an airtime card for that amount. The other phones get a $10 airtime card.